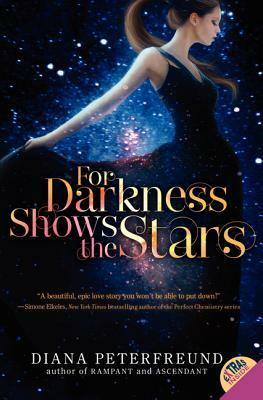 In the dystopian future of For Darkness Shows the Stars, a genetic experiment has devastated humanity. In the aftermath, a new class system placed anti-technology Luddites in absolute power over vast estates--and any survivors living there. It's been generations since a genetic experiment gone wrong caused the Reduction, decimating humanity and giving rise to a Luddite nobility who outlawed most technology. Elliot North has always known her place in this world. Four years ago she refused to run away with her childhood sweetheart, the servant Kai, choosing familial duty over love. Now Elliot's estate is foundering, forcing her to rent land to a group of shipbuilders, including renowned explorer Captain Malakai Wentforth--an almost unrecognizable Kai. And while Elliot wonders if this could be their second chance, Kai seems determined to show Elliot exactly what she gave up. But Elliot soon discovers her old friend carries a secret--one that could change their society . . . or bring it to its knees. Again, she's faced with a choice: cling to what she's been raised to believe, or cast her lot with the only boy she's ever loved.